Pixar has long had a strong presence at Disney California Adventure, the second theme park at Disneyland Resort in Anaheim. A Bug’s Life inspired the It’s Tough to Be a Bug 3D show that opened alongside the park in 2001, and a number of family-friendly rides were added to the park in 2002 with the A Bug’s Land expansion. A dark ride based on Monsters, Inc. opened in 2006. The highlight of the entire park is Cars Land, which was completed in 2012, and turned Pixar’s least acclaimed series into a peerless theme park experience. It’s not like Pixar doesn’t have a foothold in the original Disneyland, right across from California Adventure, but the newer park has always had a deeper connection with the computer animation giant. That relationship is even more pronounced this summer, as the redesigned rides at Pixar Pier open to the public this week, in the midst of Pixar Fest. With the popular roller coaster California Screamin’ being converted into the Incredicoaster (directly in the wake of Incredibles 2’s box office dominance), and the former Paradise Pier’s various midway games being rethemed to Pixar movies, Pixar Pier brings some of the studio’s most popular characters to the California theme parks more prominently than ever. Pixar Fest, the resort’s summer-long promotion, can’t be contained to a single park, though. The rides might live at California Adventure, but you’ll find various new treats and activities themed to your favorite Pixar movies both there and at Disneyland all summer. During Pixar Fest you can expect the kind of entertainment that Disney parks specialize in these days. That means nighttime pyrotechnic shows, various unique snacks, and parades full of kid-friendly pop music and high-energy choreography. And although the parades will be familiar to repeat visitors, there have been a few updates to spruce them up for Pixar Fest. 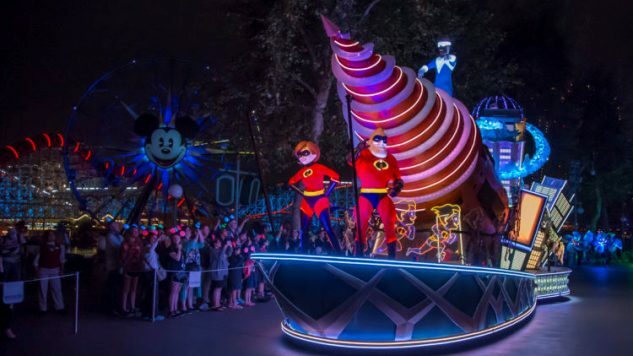 The popular Paint the Night nighttime parade will be running at Disney California Adventure throughout the summer, with a new float featuring the Incredibles. The Pixar Play Parade, which ran at California Adventure for almost a decade before closing last year, can now be found in Disneyland, with new floats based on Up, Inside Out and Pixar’s mascot Luxo Jr. When it comes to theme parks, I’m primarily interested in rides and design. I’m excited about the worlds created by the artists at Disney Imagineering, and the tricks they use to make those worlds come to life in the rides nestled within. So when it comes to something like the Paint the Night parade, I’m less invested in the singing and dancing than I am the technological marvels that the floats represent. When I look at the Monsters, Inc float, which uses pulsing lights and large screens to recreate the door motif from the movie, I’m not excited about a character from a movie I like but for what an impressive feat in engineering it is. And the new Incredibles float is one of the more impressive ones in the parade, with lights spiraling around the Underminer’s drill to give a sense of motion, and various audiovisual gimmicks recreating the powers of Violet, Dash, Jack-Jack and Frozone. Paint the Night might have lost the Frozen float due to space considerations in California Adventure, but the Incredibles float offers a kinetic thrill that more than makes up for that loss. 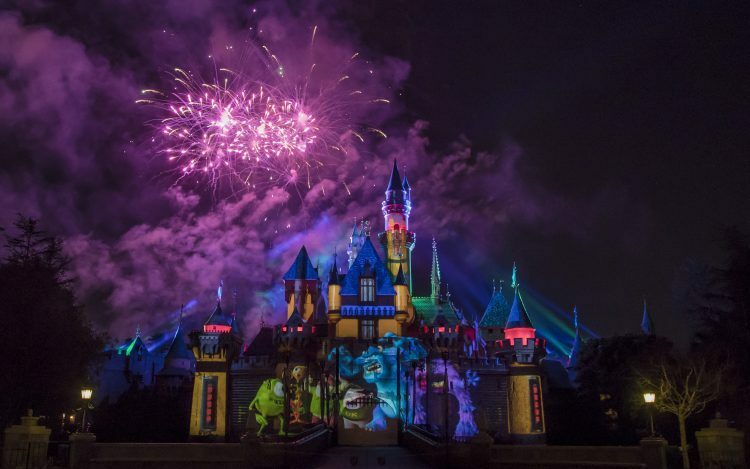 The big nighttime show at Disneyland, “Together Forever—A Pixar Nighttime Spectacular,” is another audiovisual treat, whether you’re into Pixar or not. Pixar scenes and characters come to life on a gargantuan scale through projections on places like Sleeping Beauty’s Castle and the it’s a small world building. With bright lights, loud music, and enough fireworks to ring in a decade of new years, “Together Forever” is exactly the kind of fan-pleasing overkill that Disney has trained us to expect from its pyrotechnics shows. I didn’t get to sample much of the food on hand for Pixar Fest, but I can say with certainty that the Cocoa Churro is one of the best things I’ve ever tasted at a theme park. Riffing on Coco, it’s a churro coated in chocolate powder and salted cinnamon sugar, with a dipping sauce of spicy chocolate. It’s a delicious collision of salty, sweet and spicy, easily gripped in one hand (two if you want to dip, of course). These can be found in Frontierland. Yeah, the connection to Coco is tenuous at best—the words sound the same, and it is Mexican chocolate—but how can you really capture the essence of a movie, especially one as powerful as Coco, in a dessert? That’d be like feeling the pain and loss of Bambi’s mother from a donut. Themes can only dig so deep when it comes to food. Other food specials include cookies shaped like the Toy Story aliens, a three-course meal based on Ratatouille at Café Orleans in New Orleans Square, and more. 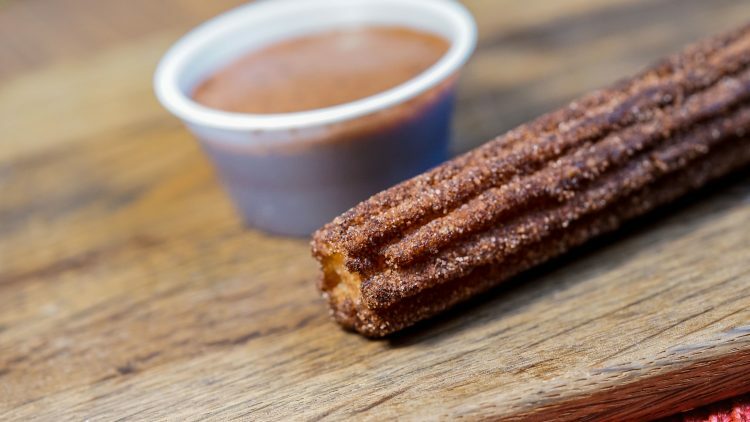 Of course that churro can also be seen as a symbol for the rest of Pixar Fest. It’s more about recognizing the references than being transported to places we’ve only seen in movies before. Don’t expect any elaborately themed spaces or thrilling new attractions. It’s basically a collection of things you already know (and might love) rethemed to something else that you already know (and also might love). Pixar Fest is more a triumph of marketing than design, with enough familiar park elements being rethemed to Pixar properties to make it feel somewhat fresh. If you’re a regular visitor to Disneyland, nothing will feel revolutionary, even if the new changes excite and entertain you. If you’re a Pixar fan excited about seeing parts of your favorite movies come to life, Pixar Fest should get the job done, even if you’ve been to the Disneyland parks before and have seen most of it before in different forms. As a summer promotion to give the heavily local crowd new reasons to visit Disneyland and California Adventure again, it’s a fun, if minor, experience. The true tell of the lasting value of this Pixar push will be Pixar Pier, which I’ll hopefully visit later this year. Until then, I’ll keep longing for that Cocoa Churro.